Dentsply Sirona, the World’s largest manufacturer of professional dental products and technologies has joined the Worlds Clear aligner systems with its MTM Clear Aligner system. It has been used by dentists for nearly ten years. So what does MTM mean” It’s simply minor tooth movements. The system consists of fully removable clear plastic aligners (PVC and BPA free) used to correct minor misalignments. These misalignments include spacing, crowding, midline discrepancy, tipping and rotation. Ideal for orthodontic relapse patients or class I molar occlusion patients with minor misalignment only. MTM aligners will only correct anterior teeth of both arches. It will not correct occlusion or posterior teeth, but rather focuses on canine to canine movement. MTM clear aligner system is manufactured with contact clarity, so they are nearly invisible when placed onto the teeth. The system is recommended for adults as the patient must have fully erupted second molars and are able to adhere to the requirements. The MTM clear aligner system should be worn all the time, except for when eating, drinking hot liquids, or during brushing and flossing. Most cases can be completed within 3 to 6 months. 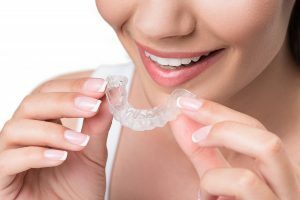 The aligners are custom treatment planned by your dentist or orthodontist and are very affordable. Each aligner advances your teeth to the next position, similar to Invisalign, achieving results in a shorter amount of time and at nearly half the cost. Unlike Invisalign, there are no buttons, attachments or brackets. All pressure points are built into the aligner internally for the best esthetics. Your family dentist or orthodontist is a qualified provider and can let you know if you’re a good fit. As with any other orthodontic procedure, you will be required to wear retainers at the end of treatment to ensure your alignment lasts a lifetime. Your dental provider will help to guide you with retainer selection.